As the unveiling of the new MacArthur Place is upon us, we are excited to introduce Michael Ross, Principal at RDC Architecture. Michael was significant in the restoration design, taking the historical pieces of MacArthur Place and weaving in purposeful updates that embraced both the history of the property and the modern desires of luxury travelers. Michael answers questions below about how his vision for MacArthur Place was brought to life. What was the driving inspiration behind your architectural design for MacArthur Place? Properties like MacArthur Place are very unique and rare in Sonoma Valley. Larger naturalistic estates like MacArthur Place are the memory of working farmsteads that use to be common in the Valley. Only a few still exist. MacArthur Place is an ensemble of historic and current buildings that are generously separated by open space, light, air, and gardens. My primary inspiration was to enhance one of MacArthur Place’s most compelling aspects – evoking clustered farm buildings in a garden landscape. My ambition for the architectural design was to reflect the past, update the facilities to contemporary hospitality standards and seamlessly integrate the buildings into a garden setting. One of the most striking elements of the new MacArthur Place is how the user flows through the space. The architectural concept of “circulation” seems to be central to your thinking. Can you tell us how you re-thought the path of travel, and fluidity of indoor and outdoor spaces? Fostering connectivity to the gardens, hotel buildings, guest serving functions, and the community was a primary objective of the design team. The campus is fluidly threaded with garden paths, outdoor social spaces and intimate connections to nature. Creating a positive guest arrival experience was very important to the hotel management team. Prior to the hotel’s transformation, the lobby was located in a smaller building adjacent to the main Barn. We proposed relocating the guest reception function into the Barn which intuitively was where guests want to go. To support this, we opened the Barn’s façade by adding new glazed openings to the exterior which provide ample amounts of natural light and views into the hotel interior from the arrival court. Reinforcing a sense of openness was introduced into the guest room buildings as well. 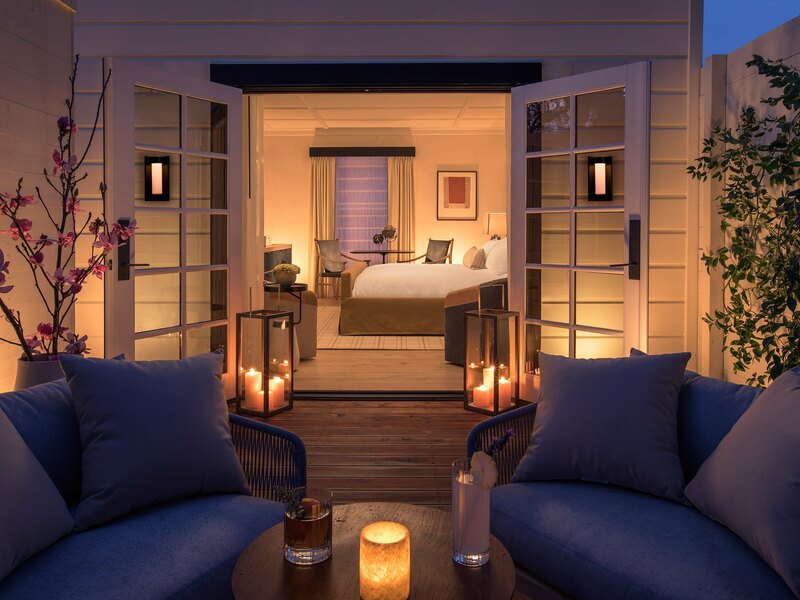 In selected guest rooms, we added new French doors opening to private lanais and outdoor showers for guests to privately enjoy Sonoma’s fresh air and Mediterranean climate. Originally the path of travel to the historic property was visually screened from view from the street by dense landscape plantings. We carefully altered the landscaping along the street creating views to the historic Burris House allowing approaching visitors to better appreciate the hotel’s sense of place and historic buildings. A new pedestrian gateway was added at the front of the historic Burris House reestablishing connectivity of the estate to the community which it is part. The historic Barn is now the figurative and literal heart of the six-acre property, housing the lobby, restaurant and public spaces. What was your vision behind this evolution? We wanted the Barn to be the social heart of MacArthur Place – a rusticated luxurious place of food, wine, friends, and art. This vision was accomplished by creating a series of larger spaces within the volume of the barn which would be inherently conducive to social gatherings and enjoyment by guests. Natural materials, finishes and furniture were incorporated into the Barn’s interior design by SFA the project’s interior design team to reinforce the sense of casual luxury which is emblematic of the Sonoma wine country experience. MacArthur Place has been rooted in Sonoma history for 150 years. How did you tell the “Sonoma” story through your architectural design? Are there quintessential “Sonoma” elements reflected in the new design? The Sonoma story is a reflection of its history, natural surroundings, authenticity and lack of pretention. Sonoma is richly textured. We believe the hotel’s architecture should reflect the same. This approach is exemplified in the hotel’s exposed beams, rustic wood floors, guestroom barn doors, communal fire pits, textured fabrics and natural palette used throughout the estate. In re-imagining this historic property, with which side of the age-old architectural dialectic of restoration vs renovation did you align? The design logic for MacArthur Place was fueled more by the notion of transformation rather than “renovation”. Much of the historic property was changed over time. Our goal was to enhance the good work that came before and edit away the prior remodels and additions that were not successful. When a building had particular historical significance, like the Burris House we carefully maintained the character-defining features of the historic building to contribute to the ongoing story of the property and community. Your architectural design for the newly-reimagined MacArthur Place deftly balances a nod to the history and heritage of the Victorian-era property while infusing modern luxury and clean lines. Describe how these disparate elements came together in your design. What is your favorite element of the new MacArthur Place design? I love the night view across the hotel’s arrival court into the warmly lit Barn interior. This is a welcoming glance into an exciting, activated social space. The view offers a sense of promise, fun and invitation which is essential to resort hotel of this caliber. View the rooms that have been reimagined for MacArthur Place.